Rev. 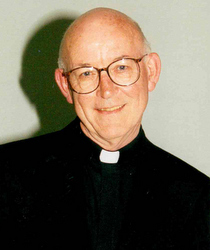 Patrick Coleman Walsh, C.S.C., 83, a native of the Diocese of Portland, died December 13, 2013, in Notre Dame, Indiana. He was born on March 13, 1930, in Portland, Maine, to Patrick and Mary (Coyne), the ninth of 10 children. He attended Cheverus Jesuit High School in Portland. After his sophomore year, he decided to enter the Congregation of Holy Cross. You may read Father Walsh's obituary, here.